Beijing opera, more commonly known as Peking Opera to westerners, is deemed the national opera of China.The accompanying music, singing and costumes are all fascinating and artistic. Full of Chinese cultural elements, the opera presents to the audience an encyclopedia of Chinese culture as well as unfolding stories, beautiful paintings, exquisite costumes, graceful gestures and acrobatic fighting.Since Beijing Opera enjoys a higher reputation than other local operas, almost every province of China has more than one Beijing Opera troupe.There're also many troupes formed by non-professional performers, who are called "piaoyou" in Chinese.Beijing Opera is so popular among Chinese people, especially seniors, that even a "Beijing Opera Month" has been declared. Beijing Opera has an over 200-year history. 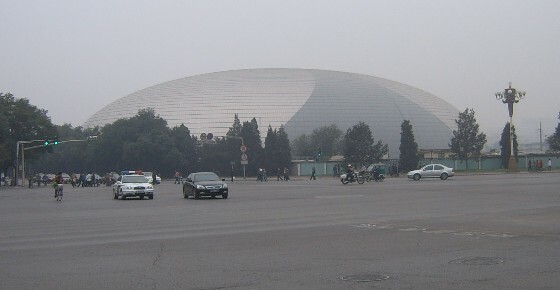 The main melodies originated from Xipi and Erhuang, originally from Anhui and Hubei province respectively and over time techniques from many other local operas were incorporated.It is said that Beijing Opera gradually came into being after 1790 when the famous four Anhui opera troupes came to Beijing. Beijing Opera underwent fast development during the reign of Emperor Qianlong and the notorious Empress Dowager Cixi under the imperial patron, and eventually became more accessible to the common people.In the ancient times, Beijing Opera was performed mostly on open-air stages in markets, streets, teahouses or temple courtyards. The band had to play loudly and the performers had to develop a piercing style of singing, in order to be heard over the crowds.The costumes were a garish collection of sharply contrasting colors because the stages were dim and lit only by oil lamps.It is a harmonious combination of Grand Opera, Ballet and acrobatic display, consisting of dancing, dialogue, monologue, acrobatic combat and mime. The Beijing Opera band mainly consists of orchestra band and percussion band. The former frequently accompanies peaceful scenes while the latter often follows scenes of war and fighting. The commonly used percussion instruments include castanets, drums, bells and cymbals. One person usually plays the castanets and the drum simultaneously, who serves as conductor of the whole band as well. The orchestral instruments mainly compose of the Erhu, the Huqin, the Yueqin, the Sheng (reed pipe), the Pipa (lute) and other instruments. The band usually sits on the left side of the stage. 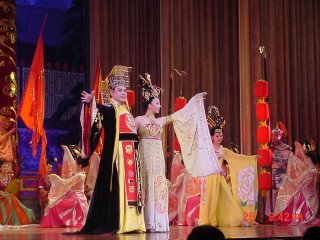 There are four main roles in Beijing Opera: Sheng, Dan, Jing and Chou. The above roles usually wear no facial paintings. "Hongsheng", another category of "Sheng" whose face is painted red, mainly plays "Guanyu" (Chinese Ares) and "Zhao Kuangyin" (the founder of the Song Dynasty). "Jing", mostly male, are the face-painted roles who represent warriors, heroes, statesmen, adventurers and demons. "Jing" is generally categorized into "Zhengjing," "Fujing" and "Wujing". "Chou" refers to clowns who are characterized by a white patch on the nose. Usually white patches of different shape and size mean different characters. They are not definitely rascals, while most of the time they play roles of wit, alert and humor. It is these characters who keep the audience laughing and improvise quips at the right moments to ease tension in some serious plays. It is said that this special art derived from the Chinese opera has different origins. But no matter what its origin is, the facial painting is worth appreciating for its artistic value. The paintings are presentations of the roles of the characters.For example, a red face usually depicts the role's bravery, uprightness and loyalty; a white face symbolizes a sinister role's treachery and guile; a green face describes surly stubbornness, impetuosity and lack of self-restraint.In addition, the pattern of the facial painting reveals the role's information too. In a word, the unique makeup in the opera allows the characters on the stage to reveal them voicelessly.